When Should I Vaccinate and De-worm my Horse? 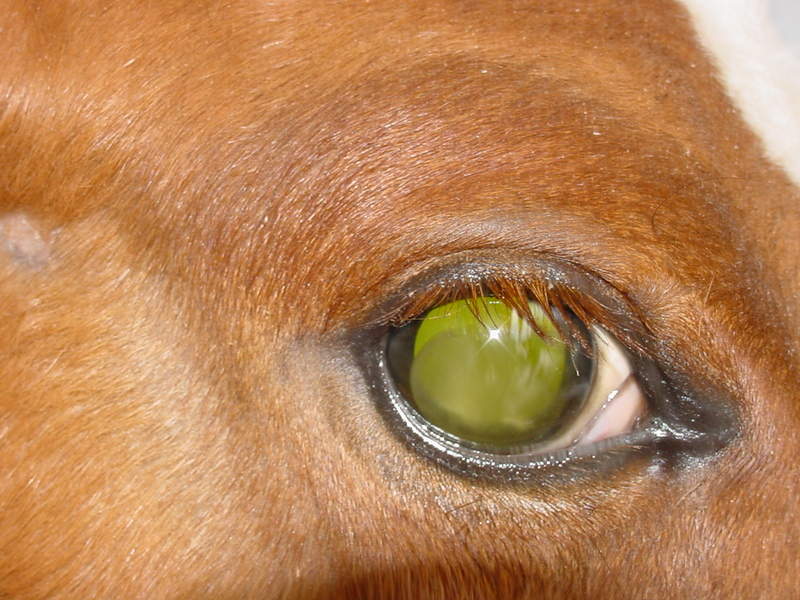 You are here: Home / News / Equine Infections / What’s Wrong With My Horse’s Eye? What’s Wrong With My Horse’s Eye? Eye problems are more prevalent through the summer and fall. It is important to be aware that any eye problem should be considered serious and addressed in a timely manner. Certain eye conditions can progress quite rapidly (within 24 hours), becoming so serious that the horse will need to have the eye removed or will become blind. Most eye problems look the same to the owner: swollen, closed and tearing. The following problems are most commonly encountered, and they all have different treatments. The most common problem is corneal ulcers. This problem usually involves one eye and tearing. Ulcers begin when the surface of the cornea is damaged. Most corneal ulcers do not threaten the overall health of the eye unless they become infected with certain types of bacteria or fungus which produce enzymes that cause further destruction of the cornea. Never treat an eye without first contacting a veterinarian. Some medications contain steroids such as hydrocortisone or dexamethasone. Steroids can cause further damage if given to horses with corneal damage. Another problem is conjunctivitis. This presents typically with both eyes involved and includes mild eyelid swelling, tearing and inflamed, red-looking conjunctiva (white portion of the eye). This can be initiated by bacteria, dust, pollen and debris in the air. A related problem and now more commonly found in Virginia is Eosinophilic Kerititis. This causes pain, severe purities and corneal ulceration. This syndrome is thought to have immune/allergic causes, so must be differentiated from more typical ulcers. Treatment is different and often complicated. The last condition is anterior uveitis. Anterior uveitis is a term which means that the front portion of the eye has inflammation within it. This presents in many different ways but typically includes eyelid swelling, increased pain, tearing and a discoloration or white-to-bluish hue over the cornea. It can involve one eye or both. Treatment options range dramatically depending on the severity. So as you can see (no pun intended! ), many eye issues look the same, but are treated very differently. Early and proper therapy is crucial to a positive outcome! http://blueridgeequine.com/wp-content/uploads/2015/11/uveitis-eye-pic.jpg 1200 1600 Dr. Jennifer LaPlume, VMD http://www.blueridgeequine.com/wp-content/uploads/2012/10/logo.png Dr. Jennifer LaPlume, VMD2016-07-22 15:29:532018-07-16 11:36:10What's Wrong With My Horse's Eye? THANKS to all of you who kept me and my horse Joe ( I'm Cotton-Eyed Joe) in your thoughts and prayers after his recent colic. Joe received EXCELLENT care and life-saving surgery from Blue Ridge Equine and Dr. Trostle. I am grateful for the experience of Dr. Trostle, the interns, the great care and frequent communication. Thank you so much for your excellent care and compassion shown to Zack and me during our visits to the clinic over the past few months. He is such a sensitive guy, and I love him so much – you made a scary and difficult time so much easier to bear. I always know my animals are safe in your hands! I hope you all know how grateful I am. A heartfelt thank you for the tremendous work your team performed on Sprout and Lulu. The past 2 weeks have been an education for me on the vast medical resources available at BREC. I truly realized the extent and depth of veterinary talents within your organization. I feel totally blessed knowing you are there for me and my equines. Thank you, Anne, Dr. Hecking, Dr. Moore, and Courtney for being so helpful through this whole journey, and for being respectful and compassionate to the end. I would recommend you all highly to anyone who is in need of a professional and caring veterinary clinic. Thank you so much, Anne, for your speedy reply and your consideration for giving me a little education in the process. This, along with the wonderful Dr. Hecking is the reason I want to be your customer! You all have a wonderful day. Just thought you might like to see pictures of Willie and me checking out the ACTHA trail at the Horse Center. Willie and I are also back to taking dressage lessons, and hope to enter Dressage With a View at the Horse Center on June 30th! Just Intro A and B, but not too shabby for all he has been through. None of this would be possible without all of your hard work, expert care and belief in us. Thank you so much! 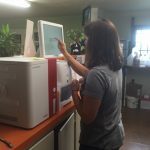 Taking A Closer Look: How Blood Tests Can Add To Your Horse’s Exam What Can We Do To Help Unwanted Horses?